#5572742 Post all RS Screenshots, Videos, and Sounds here! I was really looking forward to finding out more. Too bad he had to log out so soon. #5571260 Post all RS Screenshots, Videos, and Sounds here! Finally got this after years of bankstanding. Next up is 200M bankstanding (also updating my signature...). #5562923 Post all RS Screenshots, Videos, and Sounds here! Seriously, though, this is awesome and I feel pro. Just a little bittersweet. 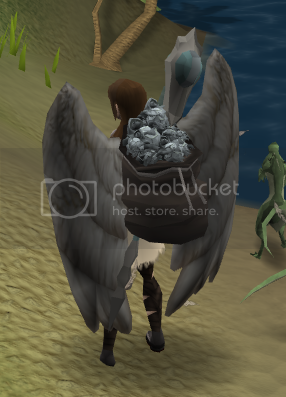 Leave 1 bond under your pillow and receive a visit from the effigy fairy! #5553352 Post all RS Screenshots, Videos, and Sounds here! My goal for the afternoon complete. #5539757 Post all RS Screenshots, Videos, and Sounds here! #5534937 Post all RS Screenshots, Videos, and Sounds here! 99 prayer party with all my friends. I got two festive paper and another present delivery but it took a while for that to happen. Also is it me or does the snowboarding feel really out of place and is kinda awkwardly designed too? Did you by any chance happened to talk to santa? It might just be that snowverload had just been defeated. I got the paper and message while I was on the ramp, so I'm not sure what happened there. Maybe its just a low chance like the random festive food too? I got 2 paper and festive foods while on the ramp. Walked over to Santa and people said Snowverload had just been defeated. So it seems that anyone in the crater when Snowverload dies gets the rewards, regardless of whether or not they help. #5533336 Post all RS Screenshots, Videos, and Sounds here! Probably so some kid who is completely new to RS doesn't accidently start an ironman acc. 1.8M total from 6 darts. Bleh. Would've been better off trying my luck on silverhawks. #5518502 Post all RS Screenshots, Videos, and Sounds here! All my interactions with MMG were quite positive. He was a nice guy and certainly did a lot of things I regard as being necessary for RS to not just survive but thrive. i also feel a gay pride style of event could be good in rs and the wearing of the robes would just be good, like a gathering for people and making a fun event. Just wanted to say i have posted this also on another forum and so far it has not been ridiculed in anyway and seems to be taken seriously which makes me wonder if this site is against people like myself. One reply is hardly a good sample size. I can't speak for the rest of the TIF community but I have nothing against you as a person, but rather with your idea that anyone who doesn't include homosexual themes is instantly anti-gay. Jagex hasn't included Canada day into the game, does that make them anti-Canadian? No. It just means that Canadians are too small a minority to pander to our every request. You just have to accept that the makers of this game can't include every group in every way.